Club Carlson has launched their year-end promotion for double Gold Points or elite qualifying nights for stays between November 4 and December 30, 2014. 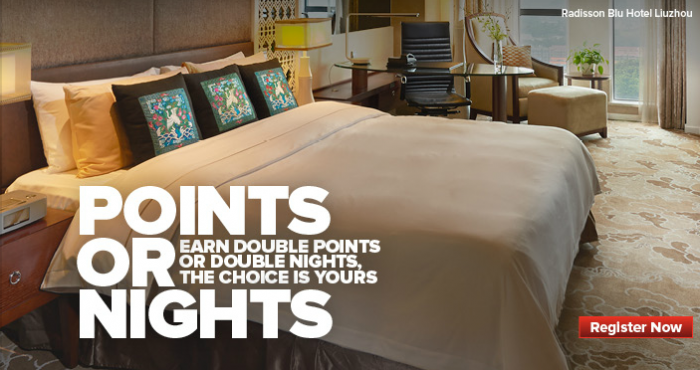 You earn 20 additional Gold Points per USD charged or one additional elite qualifying night for each night consumed. You must register for this offer and choose between points or nights here. Note that you cannot change your registration and the doubling of elite nights doesn’t apply for stays (you can qualify based on nights or stays). Getting Club Carlson Gold status via status match is easy and they have allowed it back to back. Doubling of nights could be a good choice IF you can hit the Concierge level status. Otherwise I would choose the doubling of Gold Points option. You must be a Club CarlsonSM member to participate in the “Points or Nights” promotion (“Promotion”). Promotion is valid between November 4, 2014 and December 30, 2014 (“Promotion Period”). To be eligible to earn 20 bonus Gold Points® per US. Dollar spent in addition to the 20 standard Gold Points per U.S. Dollar spent (“Double Points”), or one bonus Eligible Night for each Eligible Night (“Double Nights”), members must register online for the Promotion at clubcarlson.com/pointsornights, provide their Club Carlson number at the time of reservation or at check-in, and complete an Eligible Stay at participating Quorvus CollectionSM, Radisson Blu®, Radisson®, Park Plaza®, Park Inn® by Radisson and Country Inns & Suites By CarlsonSM hotels worldwide during the Promotion Period. A maximum of 20 bonus Eligible Nights may be earned per stay. Stays or nights paid for by redeeming Gold Points or by using Points + Cash are not eligible for this Promotion. Members only need to register once, but registration must be received before checkout of the first Eligible Stay to qualify. Member’s selection of Double Points or Double Nights applies to all Eligible Stays completed during the Promotion Period and cannot be changed.